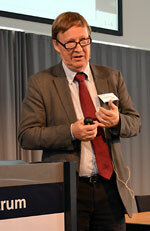 Retail and wholesale research needs to be relevant to the business to be able to live on and evolve said Claes-Robert Julander, Professor Emeritus, in his keynote speech at NRWC 2012 in Lund. More than a hundred researchers were gathered in the big lecture hall in Palaestra, Lund university, when the Dean of the School of Economics and Management in Lund, Fredrik Andersson (in the picture to the right), opened the 3rd Nordic Retail and Wholesale Conference (NRWC). – Welcome, said Fredrik, we are proud and happy to host this event with such an interesting and important program. I’m especially glad to see that sustainability takes up such a large proportion of the program, it bodes well for the future. 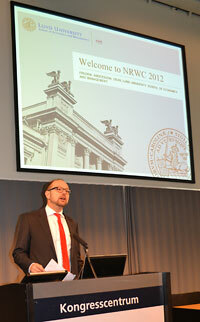 The 3rd edition of NRWC, which was organized by the School of Economics and Management in Lund, took place in early November 2012. The Hakon Swenson Foundation and The Swedish Retail and Wholesale Development Council are the financers and also part of the organizing committee. – We think it’s very important to fund this conference as a part of our aim to strengthen the infrastructure of retail research, said Andreas Hedlund from The Swedish Retail and Wholesale Development Council. – Our aim at the Hakon Swenson Foundation is similar; we want to spread knowledge about retail in the academy, as well as in the industry, and build a strong base for this knowledge, continued Jens Nordfäldt. Jens Hultman, Associate Professor, and Ulf Johansson, Professor; the main organizers of the conference from the School of Economics and Management in Lund gave the practical details to the audience before the first keynote speaker was introduced. As a former student in Lund, Anders Dahlvig who was the CEO at Ikea for ten years, looked quite at home when he entered the stage as the first keynote speaker. According to Anders one of the reasons for Ikea’s outstanding performance is that it has a vision about not just succeeding as a business in terms of profit, but also making everyday life for people better. With a strong positive vision that is lived every day in the everyday work companies can more easily attract, retain and motivate the best workers. 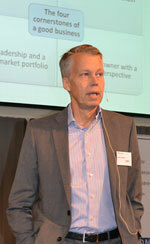 That was the first of the four cornerstones of good business that Anders presented. – At Ikea we were also able to differentiate our offer since we controlled the value chain; it’s easier to make a profit that way when you own your own brand, explained Anders. Another reason for Ikea’s success is that its offer is unique and that the company is solid enough to be able to expand to new markets without having to make a profit in the beginning. Anders also thinks the way that Ikea is owned; with one dedicated, long-term owner is a big advantage and also makes taking responsibility easier. – These days the markets and consumers expects more than just profit machines; companies need to be loud and clear about their visions and also live them every day, said Anders. From Ikea and business the next keynote speaker moved on to focus on research. Claes-Robert Julander, Professor Emeritus Department of Marketing and Strategy, the Stockholm School of Economics presented thoughts on Past, present and future challenges in retail and wholesale research. – Meeting like this makes our research field take great leaps forward and the program shows the broadness of research in this field, said Claes-Robert. But there’s still a lot more to be done. Claes-Robert continued to point out the importance of research on retail and wholesale since the business is a big part of the society, both economically and socially. – But we need to make our research relevant to the business, these days a lot of the higher education has lost the practical knowledge making the connection to the business weaker. We as researchers have to make more usesful business oriented research, which at the same time should be at the highest theoretical level. And with that the conference was duly opened and the presentations of papers started with lots of interesting discussions and results that should interest the retail and wholesale business.